Stormwater solutions from GEI Works are essential to any stormwater, erosion, or sediment control plan. Designed to protect catch basins, street drains, inlets, curbs, or other stormwater collection points, the storm drain inlet protection products work well with any site plan. Made from multiple high strength fabrics and filters, our stormwater BMPs can help address hydrocarbons, debris, and silt on your site. Our product variety can be seen below. 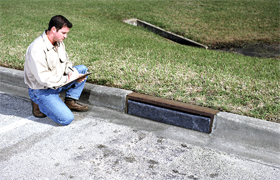 If you have questions about storm drain inlet filter or our other stormwater BMPs, give us a call at 1-772-646-0597. Taurus Hopper Under Grate Filter is durably built to filter water as it runs down storm drains by catching debris and suspended solids. The hopper is street sweeper friendly and can hold thousands of pounds of pressure. 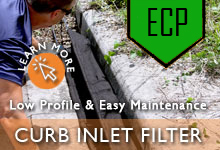 Taurus Curb Inlet Filters are stormwater solutions installed by one person in just one step. They sit invisibly inside a curb drain to catch debris and sediment until the hopper is emptied for long term curb inlet protection. Catch Basin Drain Guards are a great option for any site work taking place along roads, parking lots, or residential areas. Designed to filter and contain pollutants, the drain guards secure within the drain to catch and contain unwanted materials. Curb and Gutter Guards are an easy option for any curb side inlet or drain. 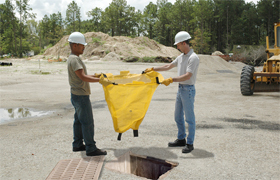 Quick to install, these stormwater solutions are an easy replacement for sandbags or other multi-step protection system. Storm Drain Covers: One of the easiest ways to protect your street drains is through the use of a storm drain cover or seal. 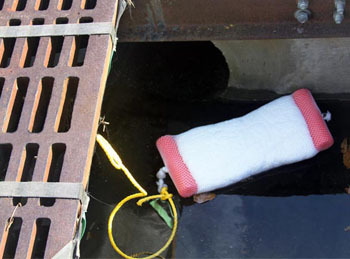 These items fit on top of drains to filter flows as they enter the drain and seal off entire systems to block contaminants. OX Oil SheenSorb Passive Skimmer: Protects storm drains, tanks, sumps, or catch basins from oil and other hydrocarbon contamination. 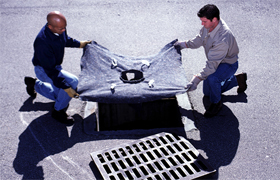 Need help installing your storm drain inlet protection products? 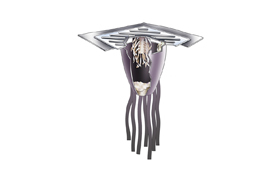 For grate hooks and other accessories, please call us at 1-772-646-0597! 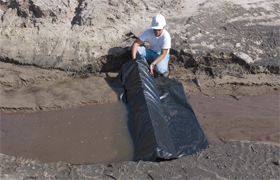 One of our most popular products for water control is the silt barrier or turbidity curtain. Please check out our Turbidity Curtain Page for options and additional information. Additional products include coir wattles, logs, blankets as well as robust Silt Fencing. Questions about stormwater solutions? We can help! Call our team at 1-772-646-0597 or fill out our quote request form to discuss your requirements.